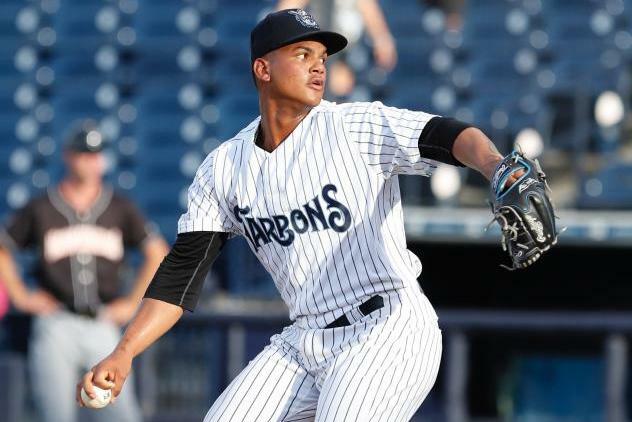 Late last month Baseball America released their midseason top 100 prospects list — they’ve been updating their top 100 list every other week this year, it seems — and, last week, they released their updated top ten Yankees prospects list. We’ve reached that time of the year when prospect lists get a fresh update. The midseason top ten Yankees prospects list is behind the paywall so I’m not going to give away too much. There are four Yankees on the midseason top 100 list and they’re the top four players on the top ten list. Duh. Here’s my pre-draft top 30 prospects. Pretty much the same names near the top of the Baseball America list with 2018 first rounder C Anthony Seigler squeezed in. Anyway, Baseball America’s midseason top ten Yankees prospects list includes a few things that caught my eye, and I want to expand on them a bit here. Here are some thoughts and observations based on the latest top ten Yankees prospects list. Statcast says Sheffield did not throw a single changeup in the Futures Game last week but I’m pretty sure that’s wrong. The system picked up two two-seam fastballs at 88.5 mph and 88.7 mph. I’m pretty sure those are changeups that were misclassified as two-seamers based on the movement. Either way, in our limited data sample, Sheffield has about a 9.5 mph separation between his fastball and slider, and a 6.0 mph separation between his fastball and changeup. The MLB averages for starting pitchers this season are 8.9 mph and 9.0 mph, respectively. Sheffield is right there with the slider. His fastball-changeup separation lags quite a bit. Also, players and coaches have long said the ideal fastball-changeup separation is 10-12 mph. The league average is just an average, not the optimal. Sheffield has a ways to go to get there based on that little bit of data. Doesn’t mean the Yankees won’t call him up before he reaches that 10-12 mph separation. It just means this is what they want him to work on. 2. Abreu’s elbow is acting up again. RHP Albert Abreu has been on the High-A Tampa disabled list since June 29th and, as usual, the injury was not disclosed. The Baseball America write-up says he has an “inflamed right elbow,” which is never good. Abreu missed Spring Training and the start of the regular season after needing an emergency appendectomy. That’s not big deal. Bad luck. The larger problem is that he missed time with a lat injury and elbow inflammation last year, and now his elbow is acting up again. He’s thrown only 129.1 total innings since the start of last season. Abreu turns 23 in September and he’s missed a lot of development time with injuries the last two years. It’s a bummer. His stuff is so good, maybe the best in the system, but he’s been unable to stay on the field and learn how to harness it. If nothing else, the fact Abreu is on the disabled list again probably takes him out of play as a trade chip prior to the deadline, at least as a headliner. 3. Pereira’s stock is way up. Last summer the Yankees gave OF Everson Pereira a $1.5M signing bonus and since then his stock has climbed in a big way. It’s not that he was an obscure prospect to begin with — teams don’t give $1.5M bonuses to nobodies — it’s that he’s making the jump from good prospect to great prospect. Baseball America had a glowing report on him a few weeks ago, and, in their midseason top ten Yankees prospects write-up, they note Pereira has a “premium tool set that includes advanced hittability and center field defense for someone his age.” The 17-year-old right-handed hitter has a .292/.345/.435 (102 wRC+) batting line in 142 rookie ball plate appearances so far this season, which is outstanding for a 17-year-old kid in advanced rookie ball (Pulaski). Pereira is hitting the ball in the air (35.6% grounders) and he’s going to the opposite field (38.5%) as often as he’s pulling the ball (38.5%). He has a very, very, very long way to go before becoming a factor for the Yankees. But Pereira, who doesn’t turn 18 until April, is developing extremely well and could be a top 100 prospect as soon as next year. Exciting! 4. Sauer has made some real improvement already. Last year the Yankees selected RHP Matt Sauer in the second round and paid him above slot $2.5M bonus even though his delivery and scattershot command had some thinking he would end up in the bullpen long-term. So far this season Sauer has a 2.97 ERA (3.96 FIP) in 36.1 innings with Short Season Staten Island — he is nearly three years younger than the average NY-Penn League player — and, most importantly, his walk rate sits at 6.9%. Here’s video of Sauer from last month and last year, before the draft. Seems like the Yankees have really helped him improve his tempo, and streamline his delivery since the draft last summer. It’s a noticeable difference, I think. “His fastball has sat in the low 90s and has touched as high as 96 mph, and he’s shown improvement in both his command and his changeup,” says the Baseball America write-up. Sauer isn’t racking up strikeouts this season (18.5%) but that doesn’t worry me at this point. Those will come in time. Point is, Sauer has made noticeable improvement with his delivery, which in turn has helped his command. Once he gets more comfortable with his mechanics and repeats them consistently, he and the Yankees can begin to focus on everything else. Sauer’s made promising strides in his limited time as a pro ballplayer. 5. Green is on the rise. RHP Nick Green, who the Yankees landed in the Carlos Beltran trade two years after drafting him and failing to sign him, earned a mention in Baseball America’s write-up as a rising prospect in the system. Statistically, the just turned 23-year-old doesn’t really grab your attention with a 3.39 ERA (4.29 FIP) and a 12.1% walk rate in High-A ball, but he leads the minors with a 66.2% ground ball rate. Baseball America says he does it with a “superb cutter.” I’ve seen his fastball described as a sinker. In this video, it’s described has a fastball that sinks and cuts at the same time, which sounds impossible, but here’s video from earlier this season. There’s definitely cut on the fastball, and it looks like it’s diving out of the zone as well. Supposedly the Yankees’ internal data — too bad minor league Trackman data is kept secret — says only a handful of pitchers in pro ball can make their fastball move like Green. The Yankees obviously like him. They drafted him back in the day, and after failing to sign him, they got him in a trade. Not a coincidence. Green will be Rule 5 Draft eligible after the season, and even though he’s yet to pitch above High-A ball and still has to figure out how to command that moving fastball, I could see the Yankees adding him to the 40-man roster. The Yankees added Jonathan Loaisiga to the 40-man last offseason despite his injuries and lack of experience because the stuff and underlying data was so promising. Green is healthy, and although his surface numbers aren’t great, the quality of his stuff could land him on the 40-man. We’ll see.